The Honourable Leona Aglukkaq, Federal Health Minister, was at the Blusson Spinal Cord Centre on Friday February 24th to announce new funding for research on cardiovascular health for people with SCI. The team research project, led by ICORD Researcher Dr. Andrei Krassioukov, is entitled Improving cardiovascular health for Canadians living with spinal cord injury: Effects of exercise and targeted education. This project is supported by a grant from the Canadian Institutes of Health Research (CIHR). The team includes Dr. Krassioukov’s ICORD colleagues Drs. Janice Eng, Tania Lam and Matthew Ramer. The group will study the cardiovascular risks and effects of exercise training in people with SCI, as they respond differently to exercise. Another aspect of the study will involve educating health care providers on specific cardiovascular problems associated with SCI to help reduce the financial burden of care, and improve treatment, for people with SCI. 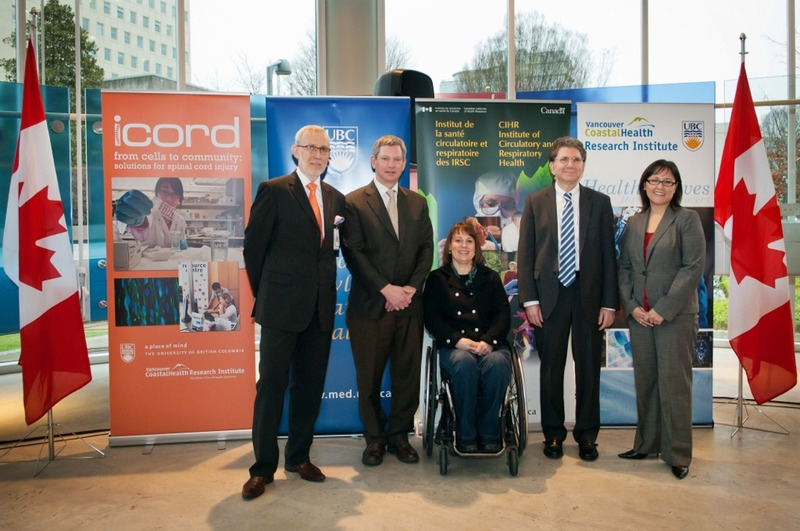 The Minister and Dr. Krassioukov were joined at the announcement by Dr. Howard Feldman, Associate Dean of Research for the UBC Faculty of Medicine, and Ms. Marni Abbott-Peter, a three-time Paralympic gold medallist in wheelchair basketball. Click for more information about Dr. Krassioukov’s cardiovascular research.